The Ministry of Foreign Affairs and the Cyberspace Administration of China will officially release the International Strategy of Cooperation on Cyberspace today. This is China's first international strategy on cyber issues. The International Strategy of Cooperation on Cyberspace, revolving around the main theme of peaceful development and win-win cooperation, aims at building a community of shared future in cyberspace and encourages the international community to follow the principles of peace, sovereignty, shared governance and shared benefits, enhance dialogue and cooperation and jointly build a peaceful, secure, open, cooperative and orderly cyberspace. The Strategy established China's six strategic goals in participating in international cyberspace cooperation. 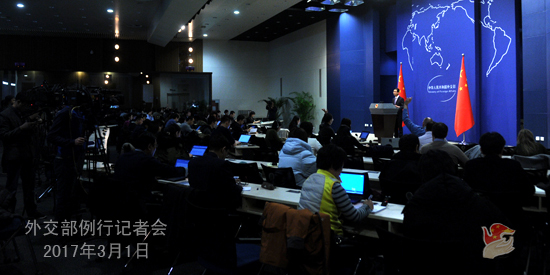 First, firmly safeguarding China's sovereignty, security and development interests in cyberspace; second, developing a system of international rules; third, promoting fair internet governance; fourth, protecting legitimate rights and interests of citizens; fifth, promoting global cooperation on digital economy; and sixth, building platform for cyber culture exchange. The Strategy also laid out a plan of action to advance international cyberspace cooperation from nine aspects. China has taken an active part in international processes on cyberspace and continued to enhance its dialogue and cooperation in this field with other countries in the world. We are ready to continue to work with the international community in building a community of shared future in cyberspace, so as to make greater contribution to security, stability and prosperity of the cyberspace. Tomorrow morning at 9:30, senior officials from the Foreign Ministry and the Cyberspace Administration will hold a press briefing on the content and background of the Strategy in the Briefing Room at the Foreign Ministry. You are all welcome to attend. Q: Yesterday Vice Foreign Minister of the DPRK Ri Kil Song started his visit to China. Which Chinese officials did he meet and what were the topics? Did they discuss the case of Kim Jong Nam? A: Yesterday I announced the visit of Vice Foreign Minister of the DPRK Ri Kil Song to China. The visit is still underway and we will release relevant information in due course. I also announced yesterday the China-Russia consultation on Northeast Asia security co-hosted by Assistant Foreign Minister Kong Xuanyou and Deputy Foreign Minister Igor Morgulov of Russia. I can briefly talk about this consultation. On 28 February, Assistant Minister of Foreign Affairs of China Kong Xuanyou co-hosted the China-Russia consultation on Northeast Asia security in Beijing with Deputy Foreign Minister of Russia Morgulov. The two had an in-depth exchange of views on the situation on the Korean Peninsula and other issues of mutual interest. The two sides agreed that the current situation on the Peninsula is complex and delicate. Relevant parties should stay calm and exercise restraint, refrain from any action that may escalate the tensions, and play a constructive role for the resumption of the talks and the political settlement of the Peninsular issue. 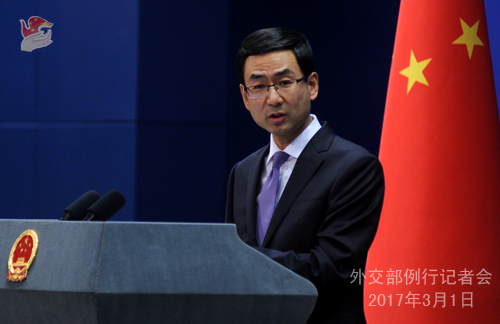 The two sides again expressed their grave concern over and firm opposition to the deployment of THAAD in the ROK by the US and the ROK, and urged the US and the ROK to respect China and Russia's legitimate and reasonable security concerns, not to do anything that would undermine China and Russia's interests and regional strategic balance, and stop the deployment process. The two sides stated that they will continue their coordination in response to the THAAD issue. I want to say that these meetings, talks and consultation, both between China and the DPRK and between China and Russia, demonstrate that as a member of the Northeast Asian community, China has acted in the principle of mutual respect and win-win cooperation, and maintained communication and coordination and advanced exchanges and cooperation with countries in this region. I believe both the visit and the consultation manifest our efforts in this regard. We hope to work with relevant countries to realize denuclearization of the Peninsula, safeguard regional peace and stability, and solve relevant issues through dialogue and consultation. Q: The ROK Foreign Minister said yesterday that considering that the DPRK is suspected of using chemical weapons to kill Kim Jong Nam, he called for stripping the DPRK of its UN membership. Does China support such proposal? A: I will not repeat China's position on the issue of Korean Peninsula as it is very clear and consistent. The situation on the Peninsula is complex and delicate. We hope relevant parties will stay calm and exercise restraint and not do anything that would provoke each other or may heighten tensions on the ground. Q: It is reported that recently Youku and other Chinese video-sharing websites have stopped updating TV dramas from the ROK and some Chinese TV channels no longer invite ROK stars to entertainment shows or TV dramas. Does this mean the Chinese government has started its retaliation against the ROK because of recent developments on THAAD? A: China's opposition to the deployment of THAAD in the ROK by the US and the ROK is clear-cut and consistent. Our resolve is firm. In recent days, I have fully elaborated on China's position and will not repeat here. As for the specific case you mentioned, I am not aware of that since I personally am not a fan of TV dramas and entertainment shows of the ROK. We have stated repeatedly that China adopts a positive and open attitude towards people-to-people and cultural exchanges between China and the ROK, and yet that needs proper popular support and appropriate public opinion. We hope the ROK side will cherish the hard-won achievements in China-ROK relations, face China's legitimate concerns squarely, heed the voice of the people, stop the deployment process and avoid causing more severe, negative impact on the bilateral relationship, our business cooperation and people-to-people and cultural exchanges. Q: US President Trump said that the US has closed more than 60,000 factories since China joined the WTO in his speech to Congress today. What is China's response? A: Since its accession to the WTO, China has been actively engaged in international cooperation. This has boosted not only its own foreign trade, but also global trade, making important contribution to world economic growth and winning wide recognition and praise of the international community. China-US economic and trade cooperation is mutually beneficial in nature. According to a report by the US-China Business Council, trade and investment between China and the US created about 2.6 million jobs in the US in 2015. I think the figure speaks for itself. We are ready to work with the US side to further deepen and expand economic and trade cooperation and bring more benefits to the two countries and the rest of the world. Q: The Islamic State released a video this week in which a man suspected of coming from Xinjiang, China swears to come home and launch terrorist attacks and shed blood like rivers. What is your response? A: I am not aware of the video you mentioned. But one thing is clear. 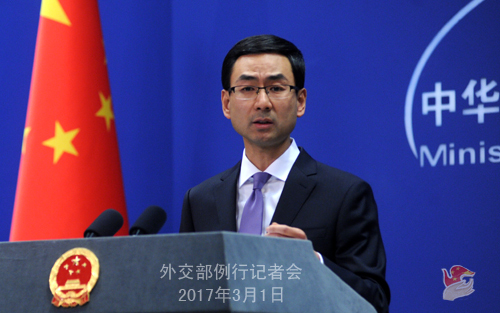 China opposes terrorism in all its manifestations, and is actively engaged in international cooperation in fighting terrorism. East Turkestan terrorist forces represented by the East Turkestan Islamic Movement pose a grave threat on security and stability of China and the region. We will work with the international community in jointly fighting East Turkestan terrorist forces. Q: When will the strategy on cyberspace be released? Follow-up: Will it be on the Foreign Ministry's website or through Xinhuanet? A: I think you can find it on People's Daily and Xinhua. Tomorrow morning senior officials from the Foreign Ministry and the Cyberspace Administration of China will hold a press briefing on it in the Briefing Room of the Foreign Ministry. You are welcome to attend. Q: Yesterday, China and Russia vetoed the draft resolution on the use of chemical weapons in Syria at the Security Council. Could you expound on China's position? A: The draft resolution you mentioned on the issue of chemical weapons in Syria was put to a vote at the Security Council but not adopted. 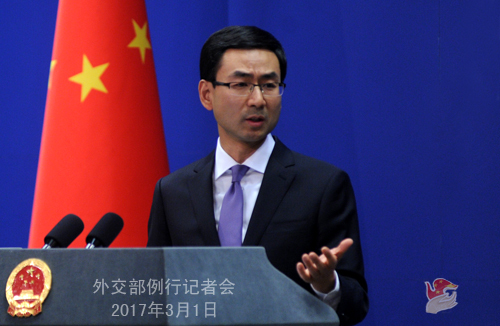 China's permanent representative to the UN Ambassador Liu Jieyi fully stated China's position on the issue in his explanatory statement after the vote. Here I would like to make several points. China believes that, this draft resolution was based on investigation conclusions which all parties still disagree on. Relevant countries forcibly put the draft resolution to a vote at the Security Council, attempting to impose unto other Council members a draft resolution about which there are still major differences among all parties. This damaged solidarity of the Security Council and did not help solve the chemical weapons issue in Syria, let alone the political settlement of the Syrian issue. Now that the Geneva peace talks on Syria have just resumed and are now underway, we hope members of the Security Council will stay together and speak in one voice in a constructive manner. I want to reiterate that China is committed to solving the Syrian crisis through political and diplomatic means. We support the UN in continuing to play its role as the main channel of mediation. China will continue to do its part so that the Security Council will take the purposes and principles of the UN Charter as guidance, proceed from the merits of the situation, and play its due role for an early political settlement of the Syrian issue.